When making payments on Open Item Direct Bill accounts, if your software locks up or is terminated without completing the transaction, the account might become out of balance. If the account is out of balance, it's because the total of the payment transactions doesn't match the total 'Amount Paid' field in the invoice (charge) record. You'll know that the account is out of balance by looking at the Open Item Payment Entry screen and comparing it to the Display Account Detail screen (Make sure you answer "No" when asked if you want to show unpaid invoices only). This is a simplified example, but the same process is used no matter how large the mess. 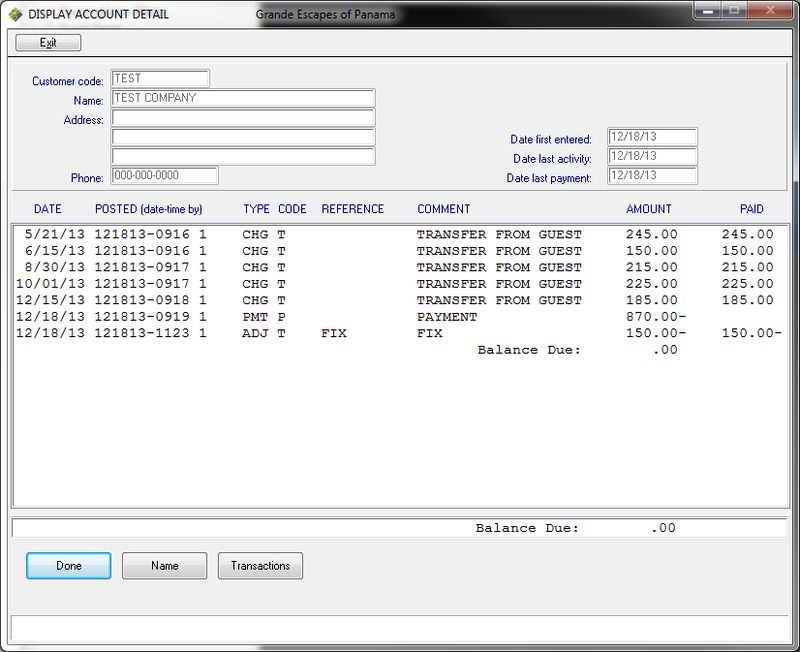 Here you can see that the Open Item Payment Entry screen shows a zero dollar balance and no unpaid invoices. But, if you look at the Display Customer Detail screen , you see that it shows a balance due. Looking at the detail, we can see that there is a $150 payment missing and that the likely invoice involved is the second one from the top, for $150.00. It shows paid, but we see no matching payment. This tells us that something went wrong when its payment was applied. In this case, because it's easy to identify the problem, we're going to use the first method to fix the account. Often, though, it isn't this simple and you can't determine when the problem occurred or which invoices are invoiced, especially in an account with a lot of activity. This is when we use the second method. You can also print the Customer Aged Trial Balance report, and it will show two asterisks (**) to the right of the account balance line. This is an indication of an out of balance account that need to be fixed. These are the two methods used to fix an out of balance account. Using this method, the Amount Paid is reset to what it was before the faulty payment was made. Once this is done, the payment is reapplied as if it never happened in the first place. Invoices must be selected and reset ONE AT A TIME. From Customer Processing, go to Enter Open Item Payments, and enter the customer code. If the invoice you're looking for shows paid in full, type "A" and press Enter in the "Invoice/seq to pay" field, to see all invoices. 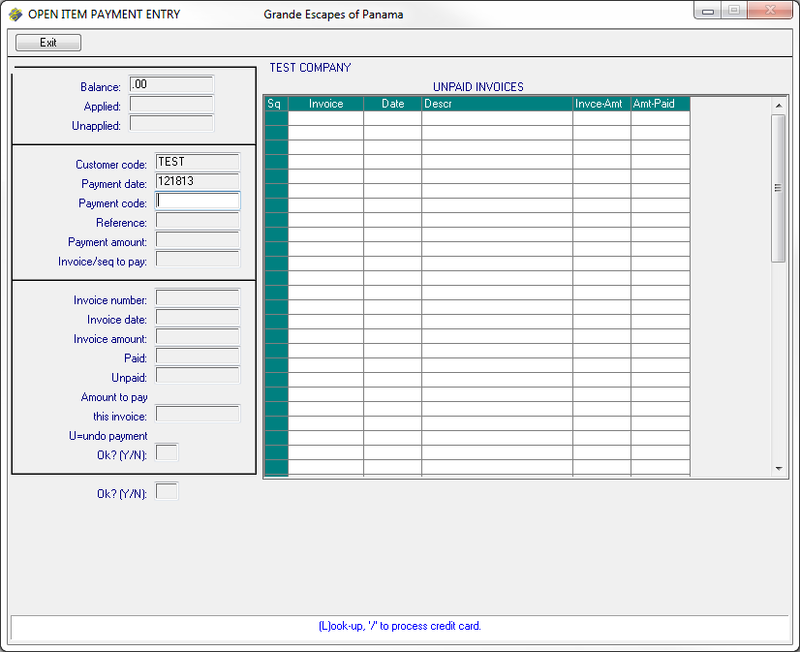 Enter the Sequence Number (the number in the first column of the invoice table) of the first invoice to adjust. In the "Amount to pay this invoice" field, enter the amount that will reset this invoice. It it was a partial payment, enter the amount before the faulty payment was made. If it was paid in full by the faulty payment, enter 0. In the "OK? (Y/N)" field, type +P. The invoice table won't reflect this adjustment yet, but it has been made. Repeat steps 7 - 9 until all invoices that need to be adjusted have been done. Hit the Escape key several times to back out until the "Customer code" field is active and press Enter to see the adjustments you've just made. You can now enter the payment, again. This method is used when you just can't identify the invoice or invoices associated with the faulty payment. The first task is to get the Display Account Detail screen to show the correct balance. We accomplish this by creating a single adjustment, whether it be a credit or a debit. Type is "A" for adjustment. Code should be "T" unless you want to create a new adjustment code. Amount should be the total amount of adjustment needed to bring the Display Account Detail screen into balance. Once the new invoice has been created, be sure to update your batch. Now you adjust the Amount Paid for this adjustment invoice. You should notice that the Balance shown in this screen is now incorrect. You've fixed the balance in the Display Account Detail screen, so now you'll fix the balance in this screen. In the "Amount to pay this invoice" field, enter the total amount of the adjustment invoice, whether it be a credit or debit. The invoice table won't reflect this adjustment yet, but it has been made. 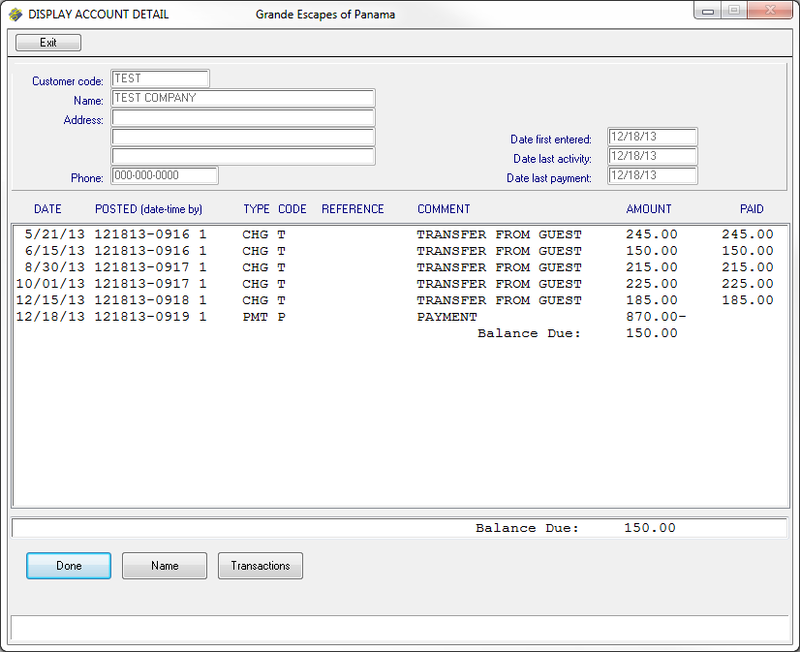 This image shows what the TEST account Display Account Detail screen looks like after this method is used to adjust it. You can see the adjustment invoice and that it's paid in full. You also see that there is no payment associated with this invoice. This was accomplished using 10 - 20, above. Had this been paid as a normal invoice is, a payment would have been generated and the account would still be off. This image shows that the Customer Aged Trial Balance no longer shows this account as out of balance. See also Open Item Payments.